the work of American missionaries in Japan. After college, he became an engineer and was involved in church-planting ministries in Kobe. Sensing God’s call to missions, he completed his M.Div. training in Osaka, studied further at Calvin Seminary, received a Th. M. at Westminster Seminary in Philadelphia, and was ordained in the PCA. At age 8, Cally was baptized and began dreaming of missions. Twenty years later, while teaching English in Japan, her faith in Christ and commitment to missions were further confirmed. She earned a bachelor of business administration from James Madison University. Satoshi and Cally met in 1992 and married in 1995. They later joined Mission to the World (MTW) and studied French at Laval University in Quebec before arriving in Africa. There, Satoshi was involved in launching the West African Theological Institute where he also helped with administration and teaching. They now serve as church planters among French-speaking communities in Quebec. 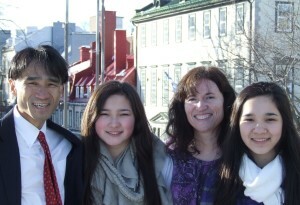 Satoshi’s ministry involves assisting gospel-centered church-planting efforts, alongside Quebecois Christians, by preaching, teaching, and evangelizing the largest unreached people group in North America, the Quebecois, as well as, ever-increasing immigrants, especially Muslims, from the 10-40 window. They have two daughters, Suzi and Sophi.